One More Revised LBF On The Way! Meet the newest member of the Little Bigfoots 2014 edition. You can see the 2012 edition right here. I'm not sure when I'll get this pattern posted. I might change the way I attach the mane first because this one took a couple hours. But maybe I was just moving slow since I should have been sleeping. It's 2:30am and I just finished him. Yup, another late night of amigurumi, it's a one woman party! I will not beat myself though because this year I did manage to revise the following LBF's plus each one has a video tutorial too! Come back soon to check on my progress, there might be a lion added to that list of available LBF patterns. Sharon you are simply amazing. 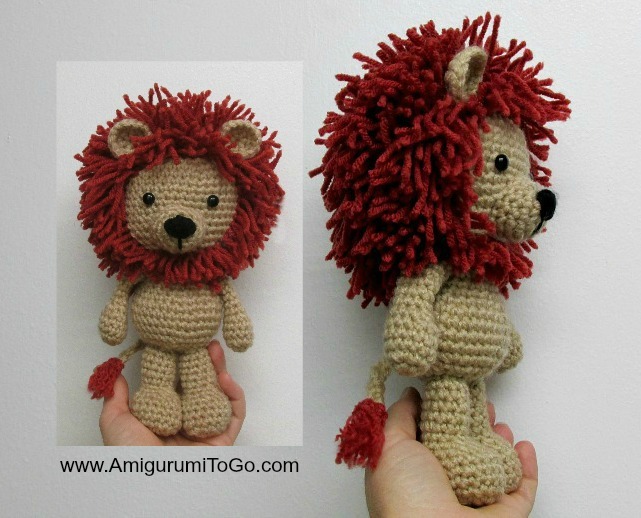 Thanks for sharing all these, I can't wait to be able to crochet your amigurumi. OMG!! i can't wait! he is so handsome! I was thinking, what the best color to buy for this handsome lion because all my yarns are black and white, and then I had this strange idea " What if Sharon Ojala sensei :) create a Little Bigfoot Sheep?! that would be awesome!" so what do you think sensei? The first lion was cute; this one is adorable. I am looking forward to the cute lion. I love your patterns can you or have you made a frog? yes I have a couple. You can use the search bar, look to your right, scroll up to the top, and it's just under the translate button OR look to you right, scroll down and you'll find "frog" in the label list, click that and all the posts with frog in it will come up. I also have a large frog pattern planned to come out before Christmas.